Being a Fellow of the Institute is an esteemed position and the ultimate accolade, recognising a level of distinction within your profession. It acknowledges not only your skills, knowledge and experience but also a sustained dedication to the advancement of the industry. Already a Fellow? Proudly let your colleagues and peers know by adding your membership grade to your profile. To become a Fellow you will need to demonstrate a high level of knowledge, competence and commitment involving superior responsibility for the conceptual design, management or the execution of important work in a marine related profession. You should have a record of original or significant contribution to a marine-related profession, sustained over a number of years. You may also have been awarded recognition for your achievements and should have a commitment to wider professional development and the aims and objectives of the Institute. Available to: Student, Associate Member, Member, Fellow. 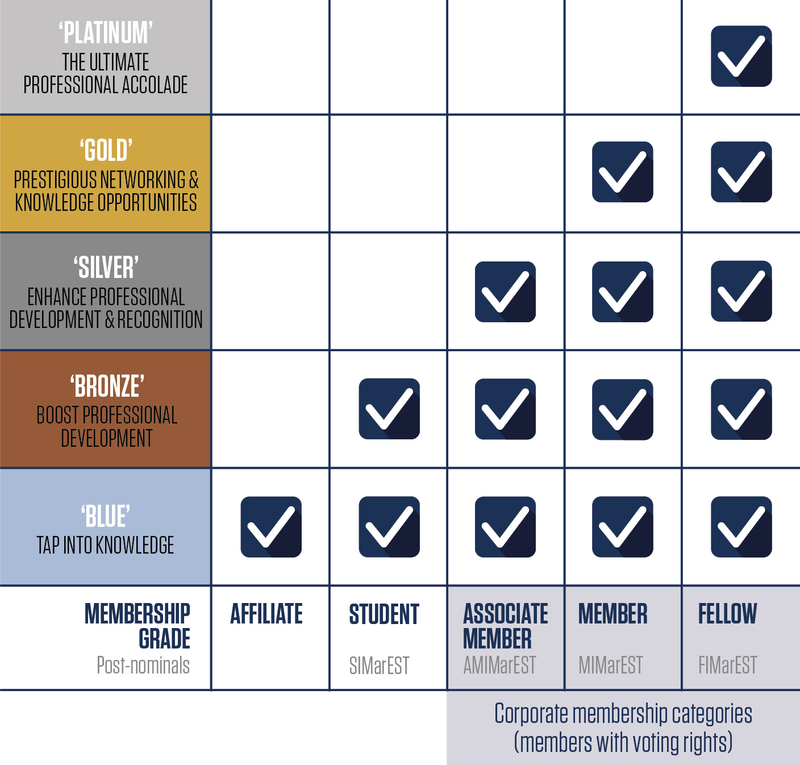 Use membership post nominals - Membership of the IMarEST is seen by many employers as an indicator of your commitment to your profession and to lifelong learning. You can showcase this through certain post-nominals, depending on your membership grade: Student (SIMarEST), Associate Member (AMIMarEST), Member (MIMarEST) and Fellow (FIMarEST). Apply for funding and bursaries - Our funding programme nurtures marine engineering, science and technology talent - apply for student bursaries and grants to conduct research, attend conferences or gain experience. Apply for free student places at IMarEST events - Some IMarEST events will offer free places for undergraduates, postgraduates, cadets, apprentices and trainees. Publishing opportunities in journals and on the IMarEST website - You can submit your research for peer-review and publication, either as short technical articles for the website, or as full submissions to our technical journals. Apply, or nominate others, for awards - Our awards programme recognises excellence and outstanding contribution in marine engineering, science and technology. Join a local branch committee - Get involved and enable branch activities in your area to benefit your fellow marine professionals and inspire the next generation. This will contribute to your initial/continuing professional development (IPD/CPD) and you will develop links with your peers, various organisations and government, as well as gain new skills outside of your job. Available to: Associate Member, Member, Fellow. Apply for professional registration - You can gain professional registration (such as Chartered, Incorporated/ Registered or Technician status) through the IMarEST. This gives you worldwide recognition for your skills, qualifications and experience by identifying that you have the key competencies valued by employers and you meet international standards for marine professionals. Access to IMarEST Echo - Echo is our online professional development platform, available via app or website, where you can access learning content and record your continuing professional development (CPD) activity and personal reflections. You can view lecture recordings, training modules, magazines and technical papers and you will be given personalised CPD tasks based on your profession and your professional registration level. Contribute to consultations on technical matters - The Institute is able to provide valuable input on many technical matters through the expertise of our membership, which spans a broad range of industries, disciplines and professions. At this level of membership, your views will be sought, and can inform, our official responses to consultations and calls for evidence to develop robust national and international regulations and policy. Access the Members Business Centre in London - Enjoy access to our Members Business Centre located at IMarEST Headquarters in Westminster, London. This includes a comfortable seating area, dedicated work spaces for hot-desking, bookable meeting rooms, free Wi-Fi, wireless printing facilities and complimentary refreshments. Eligible to vote in IMarEST elections - As a Fellow, Member or Associate Member, you get a vote in IMarEST elections and can apply for Council posts yourself. You can also nominate candidates for awards. A print copy subscription to The Marine Professional - Our monthly membership magazine delivered to your door, covering hot topics, industry trends and interviews across the marine sector. Boost your CPD through a variety of volunteering opportunities - Engage in technical activities that contribute to your continuing professional development (CPD) such as reviewing papers, interviewing peers for registration and contributing to committees. The full range of opportunities are listed in IMarEST Echo - your professional development platform. Participate in IMarEST delegations to IMO and other intergovernmental organisations - We provide the invaluable public service of giving impartial professional advice of the highest standard to governing bodies trying to develop regulations. The opportunity to participate in this work is a significant benefit of being a member of the IMarEST and includes the opportunity to sit on committees or join delegations at intergovernmental organisations and standards bodies, such as the UN's International Maritime Organization (IMO). Members and Fellows have the unique opportunity of involvement in the big decisions being taken that affect the future of the global marine community. Become an IMarEST technical consultant - As a Member or Fellow, you are eligible to take on work as a consultant for Institute technical activity and research projects in your area of expertise. Use of the IMarEST ‘Chartered’ logo - If you have Chartered status, you can showcase it using a dedicated logo wherever you choose: on business cards, stationery or on your email footer. You'll find the logo on your Membership Dashboard when logged in to the website. Establish a Special Interest Group and propose Institute technical campaigns - If a SIG covering your field of interest does not currently exist, we will provide support for you to establish one yourself. You are also able to propose Institue technical campaigns. Become a trusted IMarEST technical expert - Join a talent pool of highly knowledgeable professionals who contribute to our technical activities such as the development of regulations and policy, reviewing papers in your area of expertise, helping other members by answering questions sent to our technical query inbox, AskIMarEST?, and being invited to chair or speak at events. To be contacted about opportunities, please ensure your expertise profile is up to date in MyIMarEST. Download out this guide (PDF) for the full range of technical activities you can get involved in. Become an IMarEST Recognised Speaker - Have your lecture or speech assessed to become an IMarEST Recognised Speaker. This not only contributes to your own CPD but also provides you with a badge that assures others of the quality of your talks. Download the guide (PDF). Eligible to be nominated as IMarEST President - This is a prestigious honour and the highest position in office, fulfilling the role of the Institute’s chief ambassador. You will represent the IMarEST in the broader marine community, at external functions and events, as well as representing the global membership by serving as the Chair of the IMarEST Council and sitting on the Board of Trustees. Complimentary online access to the IMarEST’s technical journals - Complimentary online access to one of our peer-reviewed technical journals: Journal of Operational Oceanography or the Journal of Marine Engineering & Technology. You can also submit research or articles for publication, either as full paper submissions to the journals or as short technical editorial pieces for the website. Invitations to exclusive events for Fellows - Receive invitations to attend events for Fellows throughout the year, both in your area and abroad. These are great opportunities to meet people from all areas of the marine industry and build your network. Listing in the annual published list of IMarEST Fellows - Feature on a list showcasing all the IMarEST's current Fellows, which is published annually in March. Use of the ‘IMarEST Fellow’ logo - Use a logo to showcase your Fellowship of the IMarEST wherever you choose: on business cards, stationery or on your email footer. You'll find the logo on your Membership Dashboard when logged in to the website. I am a Fellow of IMarEST and chartered marine scientist, and can confirm that my professional membership has been of considerable benefit in my own career progression in recent years.